Dockless scooters: Oh, the outrage. Oh, the pearl-clutching. Oh, the incredulity. This story would be equal parts comedy and tragedy if not for the actual tragedy of two mid-major cities feigning outrage that these scooters are an affront to the decent folks of the Commonwealth. Fact check, they’re not. Welcome to the gig economy. Welcome to the sharing economy. Welcome to the 21st Century. These scooters arrived on the streets of Richmond on Aug. 16 and Norfolk on Aug. 29. Both cities made moves to promptly round them up and ruin everyone’s good time. 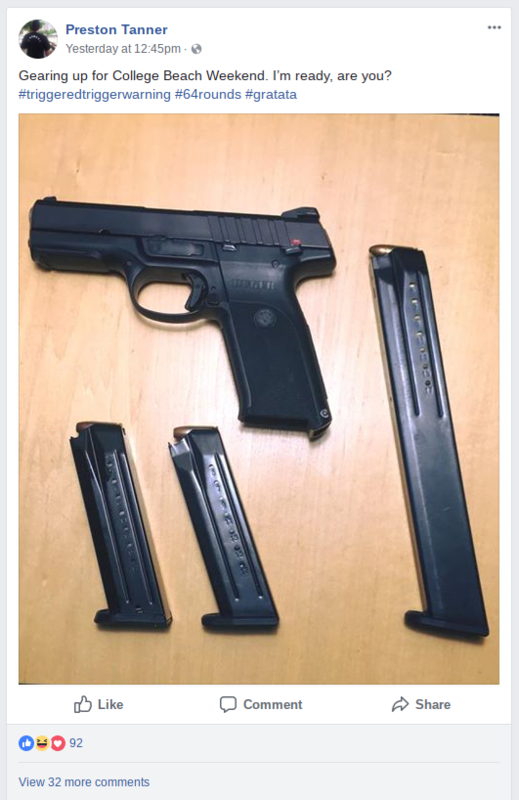 Classic Virginia. Richmond is trying to be conciliatory, however, with Mayor Levar Stoney blasting out a tweet on Aug. 17, signaling a willingness to work together, saying, “Hey Bird Ride! I like these scooters. 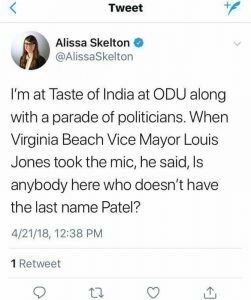 How about we get our teams around the table and make this work the right way?” He’s Virginia’s cool mayor so that makes sense (in fairness, he is pretty cool). The actual dirty work was left to the Department of Public Works, who in a letter to Bird said, “The unregulated and disorderly deployment and use of powered scooters has the potential to create a public nuisance on the city’s streets and sidewalks and endanger public health and safety.” Apparently, there is a timetable for putting a scooter ordinance before city council, but no one has actually seen it; so that’s probably on the same timetable as completing the 17th Street Farmers Market. Norfolk, on the other hand, was not so conciliatory. City Councilwoman, ‏ Andria McClellan in a tweet, said, “I’ve seen these Bird scooters littering the streets all over LA this summer. 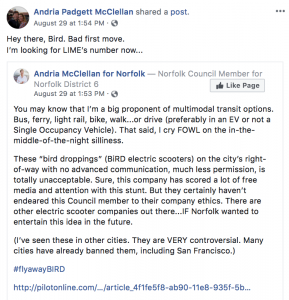 Whether or not @NorfolkVA allows them in the future, this in-the-middle-of-the-night approach is totally unacceptable and does not make me inclined to support this company.” In a Facebook post, she also said, “Hey there, Bird. Bad first move. I’m looking for LIME’s number now…” Lime is a competitor in the dockless scooter game. Scooters are apparently litter. McClellan’s observations are as petty as they are patronizing. Wanting a company to pay homage to a council member’s perceived idea of ethics (we’re talking about scooters, not North Korea) in the sharing economy at the expense of entrepreneurship in the 21st Century reeks of all the reasons why Norfolk, like Richmond, will never grow past mid-major status. Not to mention the idea of a guerrilla roll-out like this is as clever as it is emblematic of what young people are expecting from growing cities; cities that should be flexible enough to tap into the dynamism of the next-generation economy. While McClellan selectively used San Francisco as an example to make her point, a more apt example would be Austin, Texas – a city that has a similar composition to Richmond and Norfolk – and currently boasts over 2,000 dockless scooters which zip along their city streets. Instead of threatening innovative companies like Bird, Austin worked out an interim ordinance that can be reviewed every six months, giving them the option of pulling licensing should their rules be broken. The arguments for and against this technology and innovation are not stacked evenly. To think so is to fall into a self-made ambush whereby a city council or mayor, bound by their lack of understanding about the sharing economy claims “public health and safety” or in the case of Norfolk just wants to be insulting about something they clearly do not understand. While the public safety argument is a fair one, Virginia DMV already has baseline regulations in place to regulate motorized scooters under the rules for mopeds. 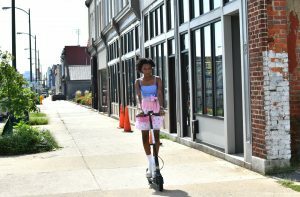 And on any given day in Richmond, you can find any number of mobility devices from mopeds, motorized longboards, electric scooters, and electric bikes cruising around the River City without incident. If a city thinks their residents are not capable enough to manage the risk in renting and riding a scooter, then they are engaged in the kind of nanny state tactics and over-regulation that kills innovation and stymies new forms of 21st Century economy. For a city to be against them on principle is to interfere with the free-market, determining and ultimately limiting which transportation options are best for their citizens. Either outcome should deeply concern and worry an informed citizenry who should be trusted to make their own decisions on transportation. Richmond and Norfolk desperately need to court the next generation economy. Both cities need to offer more than wall murals, a handful of restaurants and breweries, and Confederate monuments. Offering smart amenities that excite young people, provide flexible mobility options for residents of all financial stripes, and taps into the sharing economy is only smart business. To think otherwise is to prove just how provincial cities like Richmond and Norfolk actually are. Either way, Bird is the word. After more than half a century, Petersburg City Council has approved a motion to reopen Wilcox Lake, which was previously closed in 1958 to prevent desegregation in the area. City Councilwoman Treska Wilson-Smith brought the motion forward this year, after previously attempting to pass it five years prior. Sixty years ago, Wilcox Lake was a popular recreational swimming facility – but only for white people. In 1958, some of Petersburg’s African-American residents wanted to open the lake up recreationally to everyone. In response, the city council (which at the time was all-white), closed the lake and the entire swimming facility down. Wilcox Lake has been closed to the public ever since, preserving the area’s segregated past well into the 21st century. Even though it may not reopen as a full-blown swimming facility again, the decision to reestablish Wilcox Lake as a public recreational area is a step in the right direction for Petersburg. The 1958 decision to close down Wilcox Lake was not too surprising, given the racial tension that existed in Petersburg at the time. The New York Times reported, “Petersburg had full-dress segregation into the 1960’s, including separate Bibles in courtrooms and separate entrances and reading rooms in the library.” The city did not integrate schools until nearly 15 years after the crucial Brown v. Board of Education decision in favor of desegregation – quite the opposite of the call for racial integration with “all deliberate speed” in the 1955 Brown v. Board of Education II decision. Despite “integrating,” Petersburg implemented “freedom of choice” plans like many other school districts at the time, giving students the right to choose to attend white or black schools. The policy kept schools naturally segregated, as most students chose to stay at the schools they already attended. We’d all like to think desegregation is a problem of the past, and that all there is left to do is overturn outdated motions like that of Wilcox Lake. However, the Richmond-Petersburg area still has a major problem with isolation of certain racial groups – most prominently in education. A 2013 report conducted by the The Civil Rights Project at UCLA found nearly 20% of all schools in the Richmond and Petersburg districts were “intensely segregated,” and 40% were “stably segregated” in 2010. The lines of segregation see overlap in race and economic status; the report found that the average black student attended schools where low-income students made up more than half of the school’s enrollment. Meanwhile, their white counterparts attended schools where low-income students only made up a quarter of the school’s enrollment. Virginia’s major metropolitan regions have experienced surges in multi-racial diversity, but the CRP report found school districts across the state lacking in integration of their African-American and Latino populations. Regardless of the long-overdue desegregation of Wilcox Lake, where race relations in central Virginia are concerned, there’s a lot of work left to do. Still, it’s nice to see Petersburg working to heal the wounds left by the city’s legacy of racism. This upcoming weekend is Beach Weekend, the unofficial “spring break” for nearly 40,000 mostly black college-aged visitors to the City of Virginia Beach (VB). For residents and visitors, it’s inextricably linked to Greekfest, which drew national attention in 1989 when the city declared it a riot and called in the National Guard after making the unusual decision to stop offering programming or activities for the black fraternity and sorority members. As a result, subsequent Beach Weekends have been set against a backdrop of racial tensions. 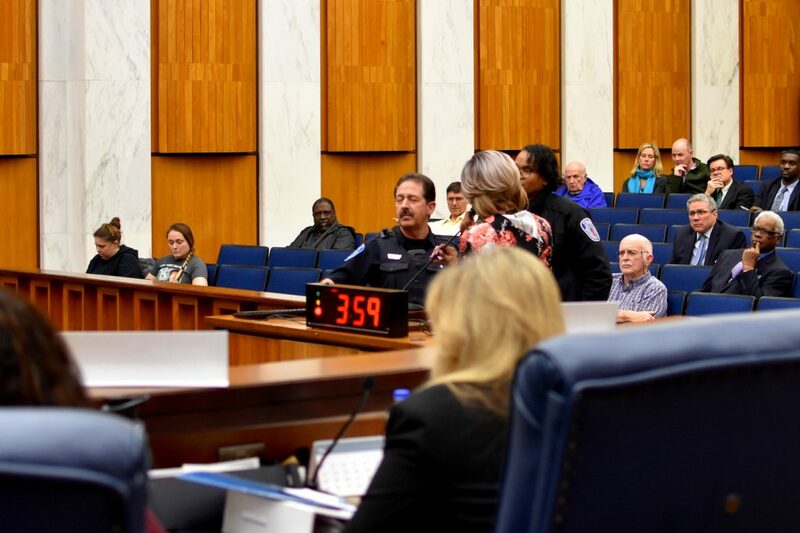 While all of the business leaders, elected officials, and community members RVA Mag reached agreed that crime and violence are an issue, there was clear disagreement on the severity and appropriateness of the city’s response. One local performer who often works the clubs during the event, DJ SDot, said that concerns over Beach Week have been blown out of proportion. “Every year I have DJ’ed for it I have never had a fight or an altercation,” he said, stating that other events, like city-sanctioned Crush Fest, also have high levels of public intoxication and corresponding arrests. He said the primary difference between Crush Fest and Beach Weekend was race, adding, “it’s only when the kids look a certain way that the people get upset and boycott. As the local business owners call it, #escapebeachweek. The fifteen-member task force included business owners, NAACP members, and local community leaders who issued a set of recommendations. In an official response, Dave Hansen, Virginia Beach city manager, accepted many of the recommendations but rejected others, some of which Strayhorn identified as the most critical. She pointed to three: Controlling traffic by temporarily reorganizing road directions along the oceanfront, providing programming and venues for visitors, and issuing welcoming proactive messaging. For his part, Hansen felt positive about the current direction the city is taking, contrasting it favorably with what he described as a past failure. “I realized about 14 months into my job as manager that we’d defaulted our job to the police,” he said about previous years. Hansen went on to say that it shouldn’t solely fall on the shoulders of the police and that the burden needed to be shared across city government. Strayhorn’s criticism also noted a lack of welcoming language for visitors, highlighting the pamphlet as mostly an attempt to comfort locals. She and another critic, city council candidate Aaron Rouse, both questioned why the city doesn’t issue similar pamphlets for other events. Hansen praised Strayhorn’s work with the task force, but said some of the recommendations go beyond his authority, “because they involved spending public funds.” Hansen and Hill also pointed to serious disagreements between residents on the event, such as a petition that circulated last year gaining over 11,000 signatures calling for an end to Beach Weekend. 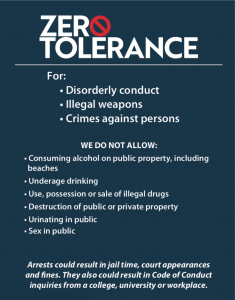 Since the beaches are for the most part public, it is not possible to “ban” the event, something Hansen said he routinely addresses at public meetings. She said she wanted to be fair to the city leadership, but felt that they’d offered few concrete solutions beyond moving port-a-lets and placing more trash cans at the oceanfront, two of the solutions Hill highlighted in a section of the city website on Beach Weekend. Hansen didn’t think his critics had a realistic understanding of the event. Speaking of previous Beach Weeks, Hansen said, “My community leadership was not there and they do not understand what was going on, so this year I am inviting all those that have an opinion about this event to come and get an understanding.” Rouse, SDot, and many others RVA Mag spoke to all said they’d been to Beach Week in the past many times. According to Rouse and Strayhorn, racist messages on social media from some business owners and residents have also increased the tension. They thought the city had a responsibility to de-escalate the situation, yet when asked, Hansen ascribed the sentiments to fear on the part of residents. Facebook posts and the decisions by business owners are only part of the growing tension. Hansen recently expressed “regret” that local Christian ministers “were offended” after a text message thread he was on referred to civil rights marchers last year at the oceanfront as “five percenters,” a reference to a splinter group of the Nation of Islam. The ministers saw the text messages after a Freedom of Information request revealed a text message string between various city officials to the public in early April. Sha’Randa Taylor delivered an impassioned plea before City Council Monday night. 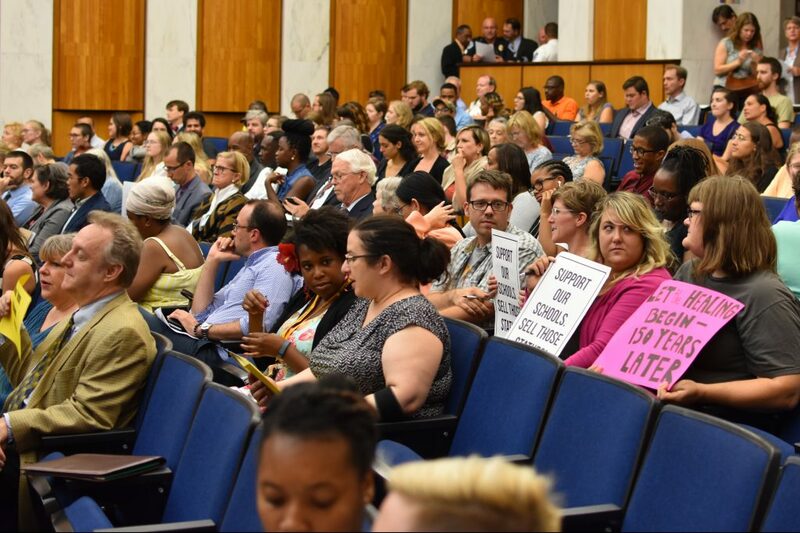 Displaying a clear container containing what she said was her fetus, recently miscarried due to the stress of her living situation in Richmond public housing, she called on Council for justice. Among her complaints were financial ones. She had with her a stack of receipts she said “total $10,000 in possessions I can’t get to anymore,” as they remained in a unit she no longer has access to. She also maintained that her rent was overcharged at $92 a month, $42 more than her income allowed the Authority to charge, and said she’s overpaid by more than $800 in total. Taylor said she lost her job and her unborn baby over stress, and as her 3-minute comment period ran out, she raised her voice, asking, “I am here, I am talking, do you hear me?” In a tense moment, police moved in around her before City Council President Chris Hilbert asked them to stand down. Like other residents without heat, Taylor said she was eventually offered a hotel room during the heating crisis, but it wasn’t a good solution for her and her three children she said, noting the lack of a stove. “I get food stamps. How do those help me if I don’t have a stove? I don’t eat fast food,” she said. Council Vice President Cynthia Newbille tasked Orlando Artze, the interim CEO of Richmond Redevelopment and Housing Authority, to provide that help. Taylor was joined at the meeting by a broad coalition of groups and individuals advocating for people living in public housing. The Coalition For Better Housing held a press conference in front of the Marshall Street entrance to City Hall, with many long-time leaders in social justice and civil rights. 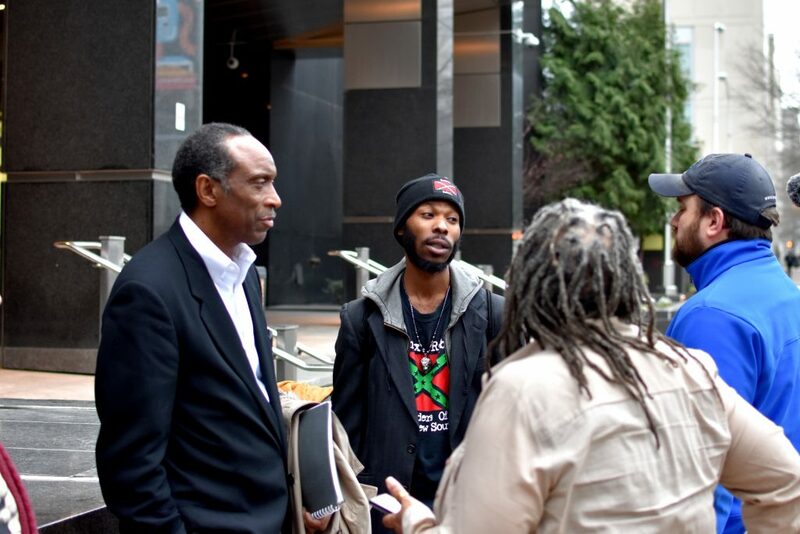 Among them were Lillie Estes and Arthur Burton, both long-time advocates for civil rights and justice in Richmond, Green party House of Delegates candidate Montigue Magruder, and Leaders of the New South founder, Omari al-Qadaffi, who brought the dire situation in city housing courts to public attention this past winter. The group cited the resignation of T.K. Somanath as a success and delivered a set of demands intended to make RRHA accountable and transparent going forward. Before the meeting, on Marshall Street, Magruder was cynical speaking on our city government “They just passed a meals tax they say is for the kids, but those same kids go back to these dilapidated homes” he said. Burton chimed in, sharing similar frustrations to Magruder’s. “These are government homes and government schools. It’s a double dose of government oppression,” he said. “If you create this narrative, that communities are isolated and blighted and ridden by drugs and crime, and you don’t provide services because you privatized the streets, then you make that narrative come true,” Burton continued, claiming that the lack of maintenance was intentional. The problem, the advocates say, is that it all comes down to accountability. Burton said the authority system, in particular, exists to give political cover for unpopular decisions, allowing mayors to point to councils, councils to mayors, and both to point back at authorities, over which they have limited direct control. “It’s the same thing from Jim Crow, you have these authorities set up to eliminate accountability,” Burton said, pointing back to the highways that were built over the homes of Black Richmonders in the 1950s. After the conference, the group headed inside, where Estes delivered their demands to Council with an extension on her three-minute speaking time. After sharing statistics on poverty in Richmond, she asked for audits or reviews of existing audits of the RRHA, inclusion of community leaders on the RRHA Board, an evaluation of the contentious tenant council system and specific positions at the Authority, and support for “Know Your Rights” trainings that educate residents about their rights in public housing. Photos by David Streever. We updated this story to add a link to a PDF of the demands. We also made a minor correction to one quote. Richmond restaurateurs are heated once again, as the city has served up a proposal for yet another hike to meal taxes. And this time, restaurant owners have united to form a lobbyist group to fight back. In his State of the City speech this week, Mayor Levar Stoney proposed raising Richmond’s meal tax to 7.5 percent to help renovate and repair Richmond City Public Schools, which would produce approximately $9.1 million a year and allow the city to borrow $150 million in new capital funding over the next five years. But that burn of a meals tax increase is an all too familiar feeling for local restaurant owners. In 2003, the city tacked on an extra 1 percent, raising the meals tax from 5 to 6 percent to help pay for the construction of Centerstage. Once the performing arts center was built, the tax was supposed to be tossed, but it remained on after a 2006 City Council vote to be poured into Richmond’s general fund for “operational costs”. Now, the new proposed 1.5 percent increase may not seem like much, but combined with the 5.3 percent state tax, the total tax would increase to 12.8 percent. To compare, Henrico collects a 4 percent tax, but surrounding counties, like Chesterfield, and Hanover, do not have a meals tax. Restaurant owners, fed up with forking over hefty payments and shifting the costs to customers and in turn, hearing complaints, losing money, and some even losing business to the surrounding counties, are fighting back with a newly formed group, the Richmond Restaurant Alliance. Jake Crocker, owner of F.W. Sullivan’s, Lady N’awlins, and Uptown Market & Deli rallied more than 30 people in the restaurant community this week to form the organization and talk about next steps to take on the proposed heighten tax. Owners from Richmond Restaurant Group, to Rueger Restaurant Group to Johnny Giavos, were in attendance, with the group representing over 100 restaurants in the area combined according to Crocker. Since the meeting, the newly-formed RRA organization has partnered with the Virginia Restaurant, Travel and Lodging Association (VRTLA), who will help push efforts forward. Matt Simmons, owner of Capital Ae House and secretary of VRTLA, said his restaurant has been a member of the association for years and like most in the community, wants the schools to be improved, but doesn’t agree with the way the city is suggesting to get the money for the much-needed repairs. The VRTLA, a political action committee for the aforementioned industries, organized a grassroots campaign in 2016 with the National Restaurant Association to help successfully defeat a proposed 4 percent meals tax increase in Fairfax County. Crocker, who threw his political hat in the ring this year as a Libertarian candidate for the 69th District, headed up a “Repeal the Meal Tax” campaign back in 2011 to urge the city to get rid of the Centerstage tax hike that was intended to be temporary. And up until a few days ago, he, like many restaurant owners, was under the impression there was going to be a reduction in the taxes. Patrons are the ones that bear the brunt of the taxes getting collected, which Crocker said is an issue that regularly comes up at his Fan restaurants. Often the customers that complain, then, in turn, take their frustration with the taxes out on the restaurants, which was one of the many common themes brought up at the RRA meeting according to Crocker. 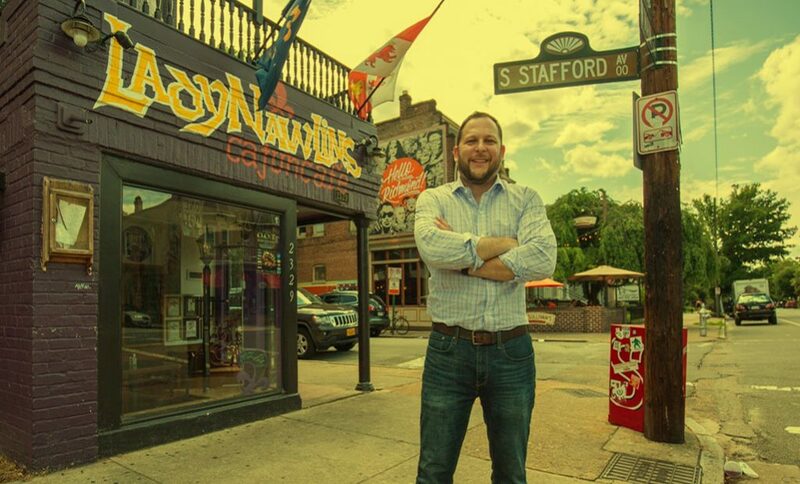 Simmons has Capital Ale House locations both inside the city, as well as Midlothian and Innsbrook, and he said customers from the counties are also steamed when they see those added taxes to their bill. Jimi Foster, Manager of The Daily Kitchen & Bar, part of the Richmond Restaurant Group which own several spots in town, said he’s constantly explaining the extra costs to out-of-towners and is not happy about the proposed tax hike. But, despite customers protesting the taxes, Crocker did address the heightened taxes on a meal will be a huge burden on low-income families and single parents working multiple jobs that need to eat out while they’re on the go with their children. Foster chimed in on this as well, agreeing that it’s going to hurt the mom and pop restaurants and working-class residents of Richmond. But it’s not just restaurant patrons that are left with a stomach ache when the bill arrives, Richmond restaurant owners are having to pay extra fees, and some have to hire employees to keep track of the taxes collected. Crocker sends between $10,000 to $15,000 a month to the city for the meals tax, and beyond that, Richmond restaurants combined are paying about $25 million a year to the city for the meals tax alone. Carter Snipes, who runs The Hofheimer Building and The HofGarden, is fairly new to the issue, but that’s been his biggest gripe. 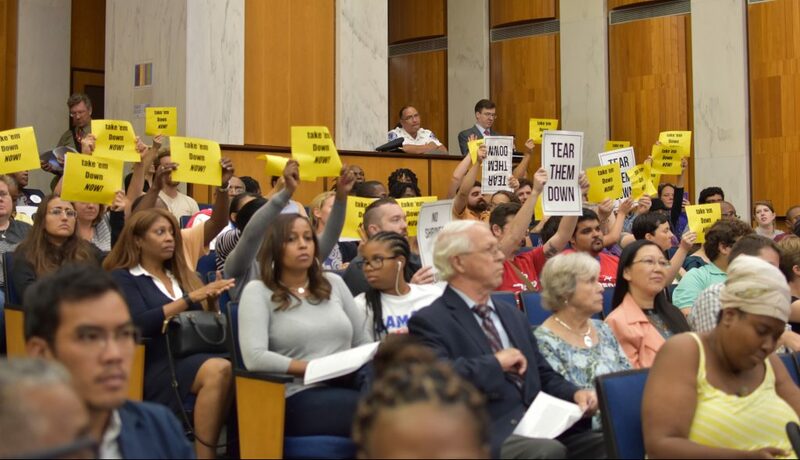 And Foster said between all the Richmond Restaurant Group’s restaurants combined, the group is paying hundreds of thousands each month to the city for meals taxes, which has forced the group to make sacrifices at their establishments. Snipes brought up the referendum on the ballot this past November, which stated that the mayor had to come up with a plan within six months of the election to repair and fund the schools without tax increases, and 85 percent of voters approved it. A recent Richmond Times-Dispatch article broke down some of the city’s spending courtesy of reports from Virginia’s Auditor of Public Accounts. According to those reports, Richmond is spending more per capita on administrative costs ($381.80), public safety ($822) and health ($823) than the state averages for each. However, when it came to education, the city spends $1,511 per capita, which is less than the state average. But Snipes, who has two children in grade school, along with Crocker, and the majority of the restaurant community stressed that they are in favor of supporting and rehabilitating the schools, but that the city needs to come up with a better way to reduce expenses and overhead. He suggested breaking up taxes to a few industries equally across the board. Crocker had a similar suggestion for the city to implement retail taxes to help spread out some of the burdens. “You put a 1 percent tax across the city on retail, grocery stores, bookstores, shoe stores, and restaurants, you’re going to get a hell of a lot more money than just restaurants,” he said. The money that was given to Stone Brewing ($31 million) and the construction of the Redskins Training Center ($10 million) were also factors that Crocker pointed to as money that could have been diverted to the schools. Simmons, on the other hand, said taxing an untapped resource like local vacation and apartment rentals would be a good source to generate revenue. Richmond Restaurant Alliance will hold their next meeting on Tuesday, and no matter where you land on the issue, Crocker said the restaurant owners are going to take action very soon. 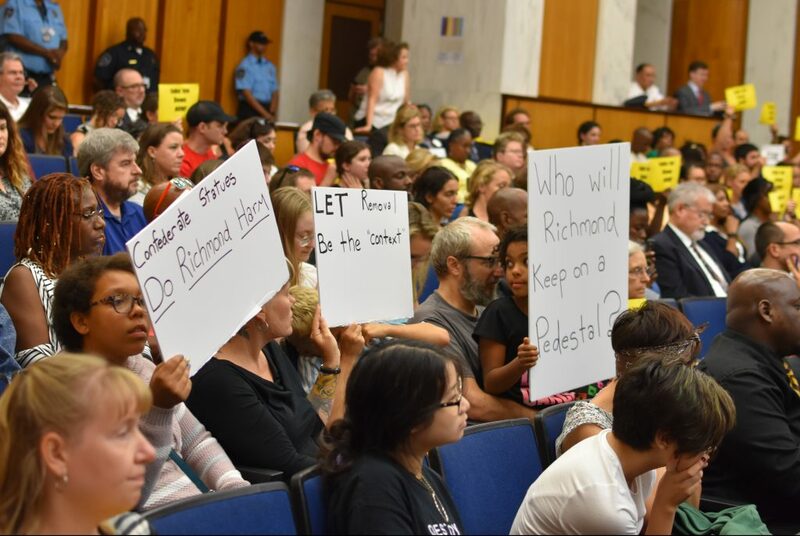 Last night’s City Council meeting almost filled the 260-seat chamber, thanks to online buzz around a resolution asking the General Assembly to permit Richmond to remove its Confederate monuments, introduced by Councilman Michael Jones. Nearly every seat was occupied by a supporter of the resolution, some standing near the back of the room when they could not find a chair, on a night when public testimony would be limited and the resolution merely introduced, not voted on. They came to support former NAACP of Richmond president Lynette Thompson, Councilman Jones, and a proposed plan to memorialize the victims of slavery in Shockoe Bottom. The resolution is not binding. It would merely permit the City Council to ask the General Assembly to allow Richmond to vote on removing any Confederate monuments in the city, listing J.E.B. Stuart, Robert E. Lee, Jefferson Davis, Thomas “Stonewall” Jackson, and Matthew Fontaine Maury on Monument Avenue as examples. Despite a clear show of support from the public, the resolution is not expected to pass. Council members Chris Hilbert, Andreas Addison, Ellen Robertson, Kim Gray, and Parker Agelasto all favored waiting for the Monument Avenue Commission to finish its work, with Hilbert, the Council President, calling the issue a distraction. The meeting tonight only had a few speakers, four of them speaking about the statues, all of whom had signed up in advance. Lynette Thompson spoke first, urging the commission to remove the statues and to expand the Lumpkin’s Jail Site memorial to include the rest of the 9-acre area where people were sold as slaves. Shockoe Bottom was the site of the second largest slave market in America behind New Orleans, and Thompson expressed worries that African American history would be erased by future development if the area wasn’t protected. The project she referred to is known as the Sacred Ground Historical Reclamation Project, and has been brought before the City Council before. Applause is not permitted, but Council patiently waited as nearly the entire room cheered for Thompson and her proposal. 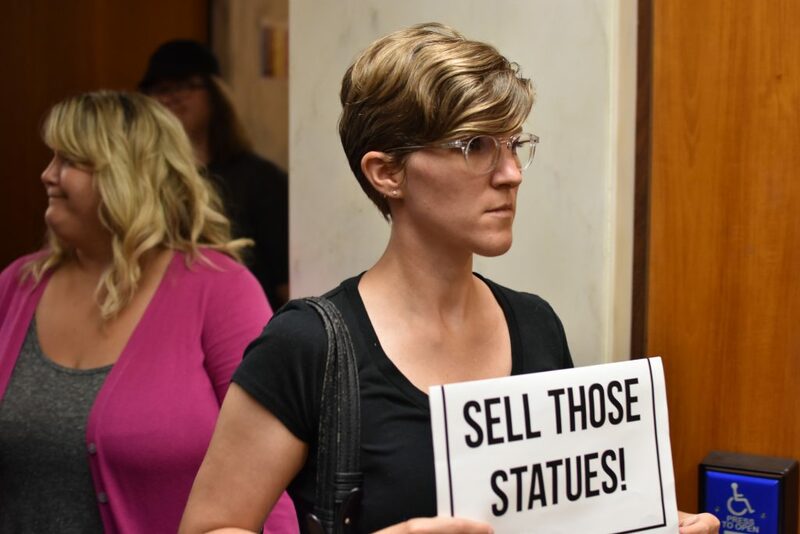 Thompson brought many of those in attendance, and Phil Wilayto of The Virginia Defender brought the bright yellow signs that read “Take Em Down Now.” After the meeting Wilayto offered his group as volunteers to remove the statues if a museum could not take them. The second speaker, former Councilman Marty Jewell, was also against the statues. “They were enacted as a middle finger,” he said, in one of his characteristically blunt speeches. He tied the memorials and monuments to Jim Crow laws, and ended his remarks by calling for a full truth and reconciliation process in Richmond. The theme of history erased was taken up next by Carmen Terrell, who spoke following Jewell. “I’ve seen our black history be removed. If the whole truth can’t be told, why have any statues at all?” She pivoted to classism and lack of opportunities for the poor, before calling for unity and support of Jones’s bill. Only one voice spoke out in dissent; Raymond Vance Baugham, Jr., was the last speaker to address the monuments. He equated General Lee to General Sherman, calling both men controversial, and made a slippery slope argument about other historical figures who kept slaves, asking why we honor George Washington, for instance. He went on to list every US President who owned slaves, and drew a few claps when he described the memorials as an attempt to heal wounds and create unity. Statues weren’t the only item of discussion, though. The meeting opened with an awards and recognition ceremony for several different individuals and organizations. Among them was an award for Richmond Kinship Month, recognizing the many people who care for children and another for RAM Camp, thanking VCU and the organization for its role in making Richmond a better place to live. 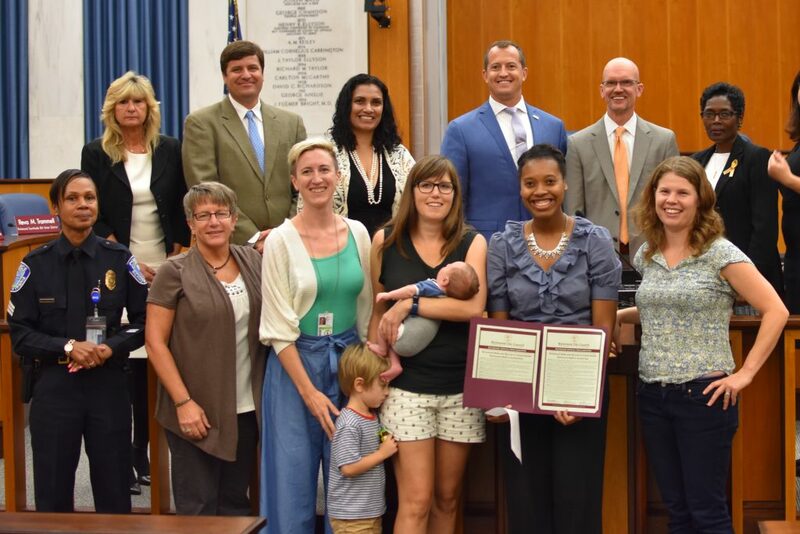 The Council also had a proclamation on bicycling, naming October Walk and Bicycle to School Month, and setting aside the first Wednesday of the first full week of October as Richmond Bike to School Day. Parents and bike activists were on hand to accept the proclamation and pose for a quick photo. The Council kept quiet during testimony, until the last speaker, who was there for a slightly different issue. “At the risk of sounding ridiculous after all these other concerns, I’m here to talk about trains.” Rebecca Stein, a Carver resident, was talking about the regulation requiring trains to give loud toots at crossings, something which starts every morning between 3 and 4 AM and continues, producing a 90 decibel noise comparable to a lawn mower. She was hoping the Council would consider adopting an ordinance that would replace the loud train horn with a different safety measure. For her, Hilbert had an answer; the Council had considered this in the past, and he’d be happy to let her know what happened with the previous process. After that, the public largely filed out, leaving a much emptier hall to the Council for their remaining 40-odd agenda items. The next meeting is October 9th, but it’s unclear if the Council will vote on the resolution at that date.